Coaches & Teams Sponsorship: Join TEAM TIER ONE today! Tier One Sports is excited to provide coaches, college teams and academies with top quality strings at discounted prices. We offer strings for players at any level, from the beginner to international tournament player. If you are currently playing with strings like Babolat Babolat RPM Blast®, Tecnifibre Black Code®, Head Sonic Pro Edge®, or Solinco Tour Bite® we are certain we can offer you the SAME OR BETTER PRODUCT - most likely at a MUCH BETTER PRICE! If you are interested in becoming part of TEAM TIER ONE please fill out one of the forms and we will get back to you about sponsorship opportunities within 2 business days. 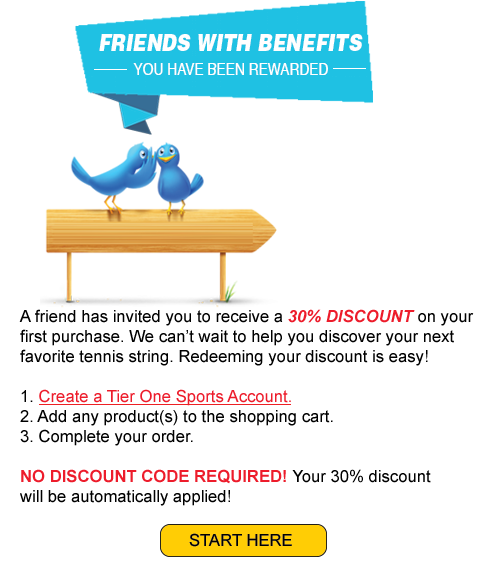 Yes, we offer tennis strings to tennis coaches at discounted prices. Help us introduce our products to your students/clients! If you have not yet had a chance to test our strings use discount code: SweetDealEU during checkout and receive 40% OFF on all single string set. Which Tier One Sports string would you like to play with? If you work with junior players, who is (are) currently your highest ranked player(s)? How many years have you been teaching/coaching tennis? How many students do you approximately teach/coach on a weekly basis? If you are currently working for a tennis club/academy what's the name? Tier One Sports offers special team prices to league teams and academies. We guarantee top quality strings at highly competitive prices. How many string reels do you expect to purchase a year? What is your Team Name/Academy Name?